MAKE YOUR IDEAS EXPLODE INTO COLOR! 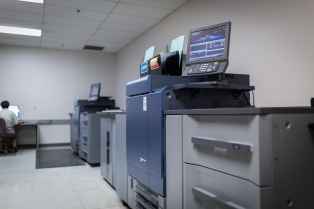 In addition to our offset capabilities, we also provide high-quality digital printing suitable for a variety of short-run and variable data applications. Variable data means that each piece can be uniquely customized to that particular recipient. Digital printing has gone through a number of improvements in recent years due to the desire for high quality like offset but still get the flexibility and cost benefits that digital technology can bring. Digital standards have come a long ways and James Printing is staying at the forefront of these developments by making consistent investments so we are able to offer the latest in digital printing. Our digital printers image up to a 13” x 20” sheet, perfect for fliers, postcards, posters, promotional materials and short-run booklets up to 9” x 12” with bleed. We offer basic inline finishing solutions as well as a full complement of offline bindery options. We understand the importance of adding details to products to help personally connect with clients. Adding that personal touch to your print project can increase a favorable response to your campaign. Using personalized digital features such as PURLs, QR codes or customized maps can help better target your message to resonate with your audience. An extra personal touch, such as customizing your content, has been shown to increase your response rate by as much as five times. Let our experts work with you to find the best custom solution for both you and your target audience. With our vast experience, we have the expertise to make sure your final product is one you’ll be proud of. Contact Us to see how to make your digital printing explode into color and how digital printing can save you money.